After I put up the entry about the Gross family, I realized that when I first started this blog, one of the things I was going to do was write something about Father Michael. For a long time, everyone seemed to know he was a relative, but nobody was sure just how that worked out. In fact, it was curiosity about the relationship that got me digging into the family tree a while back (an effort that goes in fits and bursts of energy with long periods of inactivity in between). 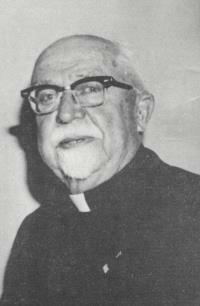 Sometime in the 1960’s, Father Michael became a regular visitor at my grandparents house. As we came to learn, he had been cloistered in a monastery since he was 13 years old (since about 1910). The monks had loosened the rules, and he was now allowed to leave to visit relatives. BUT, his family seemed to have disappeared in the 50 years since he was left with them. The only relative of his that the monks could locate was my grandfather, William A. Schmitt. So how was he related anyway? You are currently browsing the archives for the 'Reder' category.